NOTICE: Activation key must be used on a valid Steam account, requires internet connection. ABOUT THE GAME	10 years after its initial release, Legend of Kay - Anniversary is a thoroughly remastered version of the original game: high-resolution textures; new, more detailed character models; modern rendering techniques and crystal-clear surround sound give this great classic a new shine. 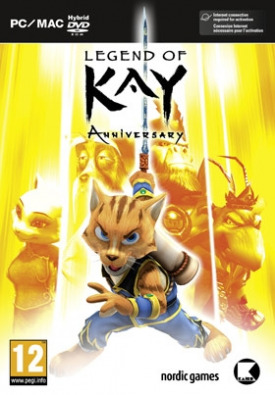 Full… of fond allusions to old martial arts films and pop culture quotes, Legend of Kay - Anniversary is both an incredibly funny game and a challenging action-adventure for young and old alike.KEY FEATURES 25 different levels with over 15 enemy types and epic boss battles. 3 different primary weapons (sword/hammer/claws) with distinct combat styles. Various mini-games such as wild boar racing, dragon flying and wolf riding. Online rankings: compare your score with your friends’ and compete against the best in the world.Features alternative: 10 years after the initial release comes Legend of Kay – Anniversary. High-resolution textures; new, more detailed character models; modern rendering techniques and crystal-clear surround sound. 25 different levels with over 15 enemy types and epic boss battles. 3 different primary weapons (sword/hammer/claws) with distinct combat styles. Various mini-games such as wild boar racing, dragon flying and wolf riding. Online rankings: compare your score with your friends’ and compete against the best in the world.SYSTEM REQUIREMENTS Windows Minimum Requirements:OS: Windows 7/Windows 8.1 32 or 64 bit Graphics: 1024 MB NVidia or ATI graphics card Memory: 2 GB RAMProcessor: Dual Core Processor at 2.0+ GHz or better Hard Drive: 6 GB available space DirectX: Version 11 MacMinimum Requirements:OS: OSX 10.7 + Graphics: 1024 MB NVidia or ATI graphics card Memory: 2 GB RAMProcessor: 2.0+ GHz or better Hard Drive: 6 GB available space © 2015 Nordic Games GmbH, Austria. Developed by Kaiko. Published & Distributed by Nordic Games GmbH, Austria. Legend of Kay is a trademark of Nordic Games Licensing AB, Sweden. All other brands, product names and logos are trademarks or registered trademarks of their respective owners. All rights reserved.